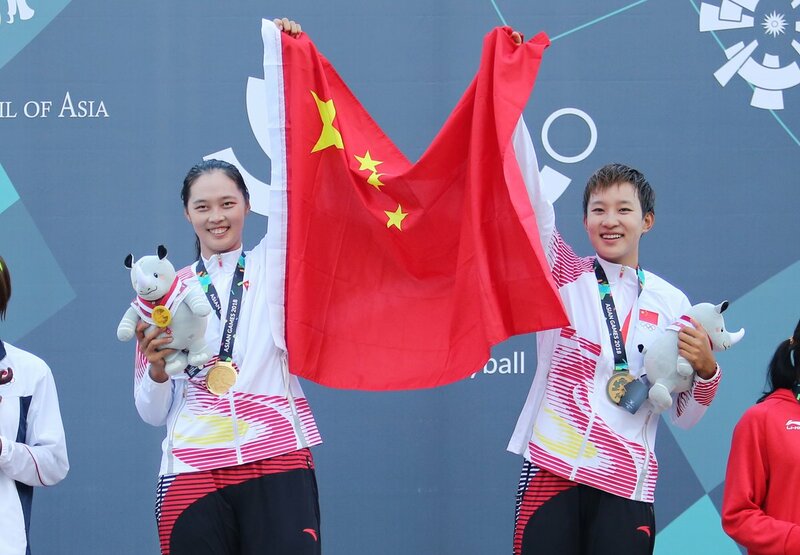 China carried on its tradition of Asian Games beach gold medals as Fan Wang/Xinyi Xia rallied past Japan’s Miki Ishii/Megumi Murakami 17-21, 21-19, 15-10 on Monday. China has now won the last five golds in beach volleyball in Asian Games history following Thailand’s win at the inaugural games in Bangkok in 1998. Xia became the third women ever to win two gold medals in beach volleyball following countrywomen Chen Xue and Xi Zhang, who won in both 2006 and 2010. Xia won the 2014 title with Yuanyuan Ma. Xia also won gold at the 2016 Asian Championships, while Wang finished third at the 2014 Asian Games and was runnerup at the 2017 Asian Championships. Together the pair won three silver medals on the FIVB stage in 2018. Ishii/Murakami, who finished fifth at the 2014 Asian Games and third at the 2016 Asian Championships, give Japan its third silver medal in Asian Games beach volleyball, following Yukiko Takahasi/Mika Saiki in 1998 and Shinako Tanaka/Eiko Koizumi in 2006. Indonesia’s Dhita Juliana/Putu Dini Jasita Utami defeated Kazakhstan’s Tatyana Mashkova/Irina Tsimbalova 21-11, 21-10 for the bronze medal. The bronze is the first women’s beach medal for Indonesia. All medals had previously been won by Thailand, China and Japan. The men’s beach medals will be handed out on Tuesday as Qatar’s Ahmed Janko/Cherif Samba will meet Indonesia’s Ade Candra Rachmawan/Mohammad Ashfiya for the gold. 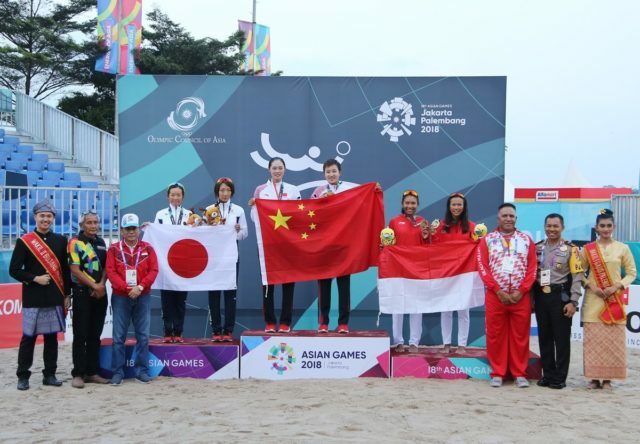 Neither country has ever won an Asian Games beach gold. Indonesia boasts two silvers (1998, 2002) and two bronzes (1998, 2006). Any medal would be the first for Qatar. China’s Peng Gao/Yang Li will play Indonesia’s Gilang Ramadhan/Danangsyah Pribadi for the bronze. China has won a medal in all five previous Asian Games: gold (1998, 2006, 2010), silver (2006, 2010, 2014) and bronze (2002, 2014).